"See the man with the lonely eyes..."
"See the Man With the Lonely Eyes"
Even visionaries can have lonely eyes. The Lennon Wall. Off the beaten track. But one of my favorite places to visit in Prague. Add in a guitarist playing Beatle songs and it kinda becomes magical. Maybe bordering on mystical. John Lennon could "see" a perfect world. He was a visionary. His ideals for peace thrived under totalitarianism at the "Lennon Wall", and helped inspire the non-violent "Velvet Revolution" that led to the fall of Communism in the former Czechoslovakia. If you are interested in learning and seeing more, check out my blog post from a previous trip to Prague HERE. Take a look at this video put out by Unicef using the message of John Lennon. I'm going to have to ponder this one awhile to see where it takes me photographically. I hope you find inspiration from it too. Thanks for joining in at Song-ography! I hope everyone has time to visit some of the other participants and see what they've been up too. I'm still annoyed that we missed this on our trip to Prague! Great photo! Such a COOL photo and moment! What an amazing wall! I so need to get to Eastern Europe! Tamar, I adore Eastern Europe. The history, the struggle, the rebuilding...strong people! What a visual reminder and statement. I look forward to seeing where next week's song takes everyone. What an amazing mural! Lovely shot. The song still makes me cry. Love all the Lennon in the graffiti. Very cool! This is truly wonderful. You find the best street photography ever! What an amazing wall! 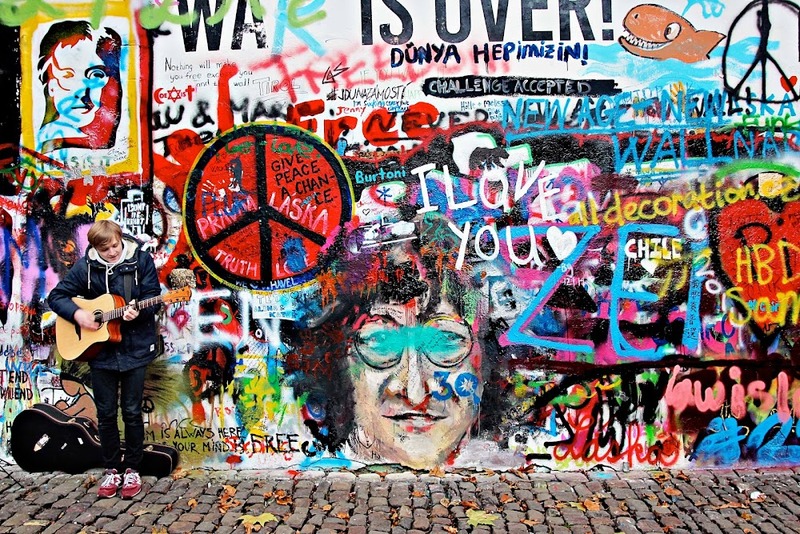 All that colorful graffiti, a likeness of John Lennon, and a singer with red shoes. You find such intriguing places to photograph, Kathy! For some reason my comment didn't post yesterday, let me try again. The wall must be refreshed from time to time bc I don't recall some of the pic/wording. Either way, it's a great wall, so colorful and you did a great job capturing it. Do you shoot with a higher saturation or do you post process? Your photos are always so clear and bright. Enjoying your snippets from your recent journey - my husband will be most interested in your post about the beer!